About a month ago on ListenUp (a TV news program that looks at news from a faith perspective) Rikki Ratcliff interviewed Greg Hall, the man who owned the company that drilled through the rock and found the trapped Chilean miners after an August 5, 2010 accident trapped them more than half a kilometre underground. Even for this Texas drill specialist the project proved very difficult. The miners' exact location was unknown. The shaft was twisty because of the hardness of the rock. But after 17 days someone heard knocking and once the original shaft was completed it was discovered that all 33 miners were alive. 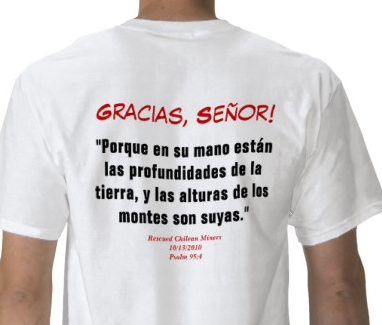 "... CCC Chile provided each miner with MP3 players featuring audio versions of the JESUS Film and the Bible – as well as a CCC t-shirt. We praise the Lord that during their time underground, two miners found Christ, as well as one of their wives, and others found a renewal of faith. Back at home in Texas, Hall continued to pray for the trapped miners and mull over ways they could be rescued. During that process he came in contact with Brandon Fisher whose Pennsylvania company owned a powerful hammering drill head. He devised a plan with that equipment, and the Chilean government approved his plan (called "Plan B" as they were simultaneously considering other rescue methods). His efforts and the efforts of his crew eventually delivered all 33 miners back to the surface on October 10, 2010, 66 days after the accident. In his ListenUp interview Hall spared no effort in giving God the glory for the rescue's success. "You couldn't have drilled that hole," said the man who had proposed Plan A, "God must have drilled it!" Hall agreed. He recounted how God's presence had sustained him and his workers, keeping them going through harsh physical conditions, little sleep, discouraging setbacks and the very real fear that at any time the drilling could trigger a cave-in or rock shift that would kill the miners below. What impossible situation are you facing today Even if it looks like there's no way out or through it, let the reality of God's higher thoughts and ways buoy your faith and keeping you looking up. PRAYER: Dear God, thank You for this rescue and the willingness of Greg Hall to give You the glory for it. Please be in my situation of ____ to do the seemingly impossible. Amen. "Plan B: Chilean Miner Rescue Story" - the entire Listen Up segment telling this story (about 20 minutes total).